Not everyone looks forward to a visit to the doctor. And some people even have an irrational fear of hospitals. But sometimes things do, in fact, go horribly wrong, as in the case of a Syracuse, New York, resident who awoke during a trip to the emergency room to find that doctors were mistakenly preparing to remove her organs. The Post-Standard reports that in October 2009, Colleen S. Burns was taken to the emergency room at St. Joseph’s Hospital Center, suffering from a drug overdose. Although a nurse told doctors that Burns was recovering from her overdose, those same doctors pronounced her dead. A call was placed to her family informing them that Burns had passed away, and the family subsequently agreed to have her removed from life support and gave the hospital clearance to harvest her organs. But Burns was not dead. In fact, a number of signs clearly pointed to her being alive. When a nurse performed a mandatory reflex test on Burns, her toes curled downward. She appeared to be breathing independently of a hospital respirator, and her lips and tongue were said to have moved moments before doctors prepared to remove her organs. Nonetheless, the nurse then followed instructions to give Burns a powerful sedative, a seemingly unnecessary move if the patient were actually dead. Thankfully, Burns awoke moments before doctors were going to cut her open to remove the organs from her presumed-dead body. "Despite this sequence of events," said a federal report from the Centers for Medicare and Medicaid Services, "intensive objective peer review and root cause analysis of the case was not done by the hospital's quality assurance program until prompted by the Department of Health." "They were just kind of shocked themselves," Burns’ mother, Lucille Kuss, told the paper when asked how doctors responded to the morbid mistake. "It came as a surprise to them as well." It’s unlikely that Burns’ case was entirely isolated. A report from the American Association for Justice claims that preventable medical errors are the sixth largest cause of death in the U.S. The hospital was sanctioned for its actions and cited for a number of mistakes that placed the patient’s health in jeopardy. But in a development that is nearly as shocking as the mistakes themselves, the hospital was only fined a total of $22,000. Burns herself declined to sue the hospital after the incident even though the hospital, whose motto is "A Higher Level of Care," never even explained to her why the mistake had occurred. Although the fines were levied in September 2012, they were first made public in a reported obtained by The Post-Standard on Sunday. Burns, who fully recovered from her injuries at the time, committed suicide in 2011 at the age of 41. But her mother says Burns was already suffering from a number of issues and that the hospital incident did not play a role in her eventual suicide. "She was so depressed that it really didn't make any difference to her," Kuss told the paper. 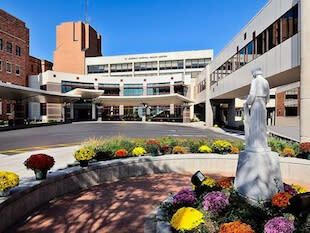 For its part, St. Joseph’s has stood by its medical staff. "St. Joseph's goal is to provide the highest quality of care to every patient, every time," Howell said in an email to The Post-Standard. "These policies were followed in this case, which was complicated in terms of care and diagnosis," Howell said. "We've learned from this experience and have modified our policies to include the type of unusual circumstance presented in this case." And as if all of that is not unsettling enough, one consumer advocate told The Post-Standard that there’s currently no way of accounting for how often these cases happen, because there is no centralized system for collecting information on hospital errors. "These sorts of things do happen," Lisa McGiffert, director of Consumers Union Safe Patient Project, told the paper. "It's pretty disturbing."